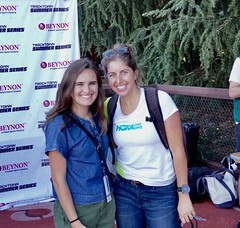 The PreClassic is one of the TOP professional track meets in the World! I highly recommend that you see it! You will see many Olympians and Olympic Hopefuls in this event. This Diamond League Meet is usually up in Eugene, Oregon-but Eugene is building a New Amazing stadium, so Stanford stepped up to help host the meet this year. We are given 10 minutes to rally 7 races during the High School track meet. 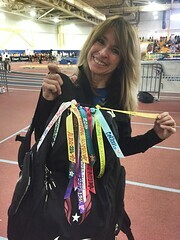 Coach Joy will meet you by the Snack Shack by the track at 5:30pm. ARRIVE EARLY there will be many team buses, vans & cars. Meet Coach Joy at 5:30pm to sign up. Bring friends, too! 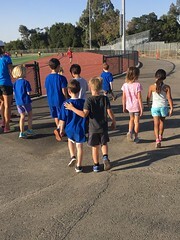 You do not need to be a Jackrabbit to race in the Kids 200m Race, but wear your Jackrabbit Team shirt if you can! Yay Team! Yay!!! Come race a 200 meter with your age group!! Watch a real awesome meet after/before your race!! This race is during the Stanford Invitational Track Meet. It is a college & high school meet..and there is a special, highlighted race for the kids! The race begins at 1:12pm SHARP..it is important to meet Coach Sunny near the Brick Information Building outside the track @ 12:45pm. …there, we will divide into age groups to race: 4 & under, 5, 6 ,7…etc..and walk to the start of the 200m. (This 200m race is open to all kids ages 12 and under). This is a great opportunity to run a 200m..the crowd will cheer for everyone & it is a fun experience! Yay!! Everyone racing receives an award, too! (..races are over by 1:30pm ..college races immediately follow!). Parents may walk out to the start with the children & also wait at finish line. HOWEVER, there is a high power meet happening around this 200m event for kids..so Please be aware of other athletes in the infield. So, after the fun kids races, we must exit the track immediately. Arrive early! There will be tons of team busses & cars parked all over. Jackrabbits meet at 12:30pm on the field at our blanket and tent. We warm up, do our drills and then see who wants to do the relay! The relay is at 1pm sharp! 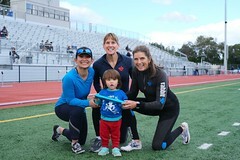 We even have parents run in relays too (if you want) ! Participate or spectate! Bring a lawn chair, blanket, snacks, friends, family, etc! Fun! What did Coach Joy do on her holiday break? 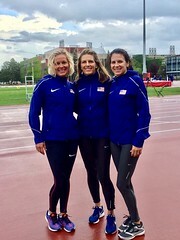 …..She was selected by the Pacific Association to go to the Annual USATF Meeting to connect with the Track & Field governing body! She was able to attend meetings of : High Performance, Masters Track, Women’s Track Coaching Association, Team Managers and Development. Always staying connected with her profession! …..She was selected to attend the USATF Level 3 / IAAF 5 Coaching Academy at the IMG Academy. This is a coaching academy where 28 elite Sprint/Hurdle coaches were selected to participate. She found that confirming what she knows and learning more tips & techniques from the High Performance lectures were great! She LOVES that! Always staying current with her profession! ……She can’t wait till Winter Jackrabbits begin to share some new tips! Yay! !